Crystal is a beautiful and vibrant young woman who graduated from a New York City District 75 school at the age of 21, in June, 2009. A day that is generally a happy and memorable day in the life of a young adult, was one of the saddest milestones of Crystal’s life. This wasn’t because her adopted mother, who she has been with since the age of 4, didn’t bother to show up to share this special achievement in Crystal’s life, but because this marked the day that she would leave her loving family at her District 75 school, people who truly love and care about her, and demonstrated it everyday in so many ways. This family included her teachers, paraprofessionals, therapists and other students. It was because of their loving presence in her life that she never missed a day of school and cried tears whenever there was a vacation or snow day that precluded her from being with that family. Crystal was born to a drug-addicted mother who was unable to care for her. She has no memory at all of her mother. Her aunt cared for her until she was about 4 and then gave her up to the foster care system. Crystal never heard from her aunt again until she was about 11 when she called to tell her that her mother, who Crystal has never had a relationship with, was dead – shot 28 times. Crystal has never heard from her aunt since that phone conversation. Crystal has cerebral palsy, spastic quadriplegia type. Cerebral palsy affects every individual differently. In Crystal’s case, it affects her entire body, including her arms and legs. Although she has purposeful and voluntary movement of her hands and arms, right greater than left, her range of motion is limited and the fine motor control of her fingers is not refined. However, with the function she does have, unlike some other individuals with the same cerebral palsy classification, she is able to operate independently a remote control, Ipod, video game, computer, etc. Crystal is unable to walk or bear any weight on her lower extremities and has no voluntary movement of her legs. One of her legs is much longer than the other and this is due to the multiple surgeries she has endured on her hips. Because she has relatively high cognitive function and some fine motor control of her hands, she is able to operate a motorized wheelchair, which has been a true blessing in her life. Crystal has severe scoliosis, which means that her spine is curved so dramatically that one of her lungs is actually collapsed from the pressure of her bones. Her other lung isn’t operating at full capacity either. However, you would never know, because Crystal can out talk even the most elite athlete and squeal, giggle and scream louder than anyone I know. This is only one of the many examples of the way Crystal defies classifications, diagnoses and circumstances in her life. Her scoliosis prevents her from being able to sit upright without support. Even with support, sitting upright can be very painful for Crystal. For that reason, her wheelchair has a custom molded seat which conforms to her back and spinal abnormalities. She is dependent for most activities of daily living including dressing, grooming, bathing, toileting, and transitioning. She requires the assistance of a home attendant everyday and has absolutely no independence in her life. She is at the mercy of the people who care for her. When Crystal was placed in her adopted mother’s home at the age of 4, another young girl with less severe physical challenges, one year older than her, was living there. That girl’s name is Lashauna and she received the third Blissful Bedroom makeover in 10/09 after being placed in a group home for independent individuals (see Lashauna’s page!). Unlike Crystal, Lashauna is able to walk with the assistance of crutches. Although she has limited options vocationally, she is able to carry out activities of daily living independently. She attends a day program and is able to maintain a busy social life – she has a boyfriend and many friends. Crystal and Lashauna are as close as two sisters can be. They love each other deeply. Lashauna moved out a few months after Crystal graduated. That was probably the second saddest day of Crystal’s adult life. Crystal and Lashauna are grateful that they were adopted and that all of their basic needs have been taken care of by their adopted mother. Unfortunately, unconditional love, affection and loving encouragement were not included in these needs. In fact, in the 8 years I have known the two girls and have been their physical therapist, I have wiped many of their tears away that resulted from the hurtful and mean things their mother has said to them – words too awful to repeat, words that no mother would ever say to her child. However they learned to grin and bear it because unlike you and me, they had no other choices. Despite all of Crystal’s insurmountable challenges, she is one the most spiritually wise and liberated individuals I have ever known. In fact, she is my hero. Faced with circumstances that would drive anyone into the throes of depression and helplessness, Crystal is a beacon of light, hope and love that brings happiness to every event and environment that she is part of. Her laughter is like a catchy, upbeat melody, which is contagious and uplifting. She is witty and funny and is the life of any party she attends. The name Crystal is perfect for her, because her smile illuminates her face and reflects light on all those she interacts with. Crystal is a very wise being who is intuitive, compassionate and always knows the right words to say to offer comfort. Sometimes she amazes me with her insight and wisdom. How has she survived the emotional abuse for so long? When her mother spews hurtful words and racist comments regarding her friends/school family of all different races and ethnicities, she surrounds herself in a bubble – an imaginary bubble of light and love where she is protected from the pain and animosity. Crystal’s life is about to change in a big way. Her mother has decided that she does not want Crystal to live in her home any longer. Most likely, there are many reasons for this decision, but it seems that the primary reason is that Crystal no longer represents the paycheck she used to. However, Crystal is about to be blessed. She has been accepted to live in a group home close to Albany. Being the smart girl that she is, she wanted to have an overnight visit to the facility before she committed to accepting the opportunity. Crystal returned from that weekend more excited and elated than I have ever heard her. She talked about how kind the staff and residents were and all the activities and employment opportunities that will be open to her and the fresh air and animals in the area. She went on and on with excitement and hope in her voice. It is so heart warming to see Crystal excited about her future. She is going to have her very own room in a house that is currently being built. The move is scheduled to take place in April. What better season than spring to mark the beginning of a new and positive life for Crystal. We have no doubt that Crystal’s family circle will increase as soon as she moves there because one cannot help but to be drawn to and love her beautiful spirit. Crystal’s bedroom makeover will represent the first road trip makeover for the Blissful Bedrooms team. We cannot wait to give her the room of her dreams and be there to celebrate along with her as she embarks on her new life. We need your help! Crystal is a huge Hello Kitty fan so that of course will be central in the theme of her room. If you are lucky enough to have had the loving presence of a mother in your life, you can understand the emptiness in Crystal’s heart having missed out on this. If you too were deprived of having the loving kindness of a mother or mother-like figure while growing up, you can empathize even more. Although we could never make up for the injustices that Crystal has experienced in her young life, we can surely contribute to making her feel special, cherished and loved right now! Please donate funds or materials so we can create a nurturing and beautiful room for Crystal. Lets channel that loving mother energy into Crystal’s life and show her what it feels like when someone has your back. Please donate to create the room of Crystal’s dreams! Please take a moment to view Before and After photos of Crystal's bedroom and the bedroom makeover process. Thank you to all of the amazing people who made this spectacular event possible! Whether you volunteered your time, donated money, or donated products and services, we are forever grateful and couldn't have done it without you. 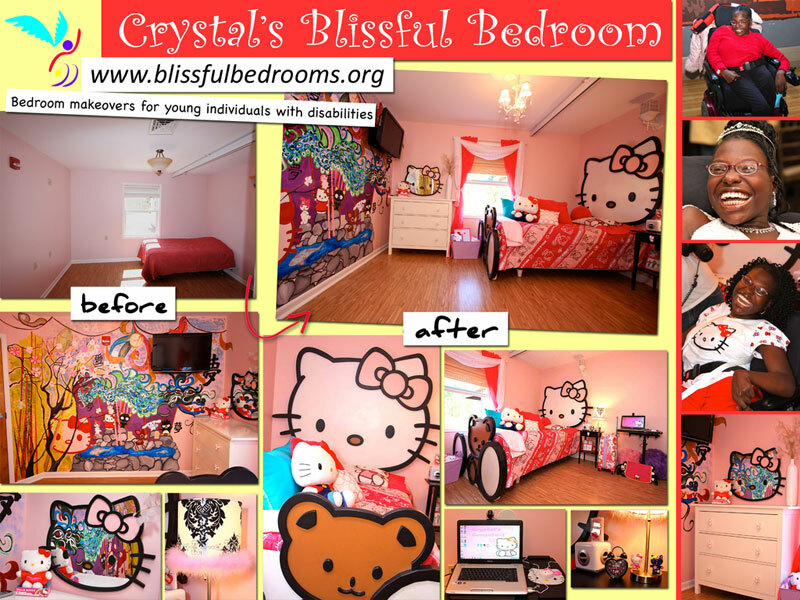 Thank you to all of the dedicated and committed volunteers who contributed to Crystal’s bedroom makeover! Thank you to all the generous organizations and people who have donated funds and materials in support of Crystal’s bedroom makeover! If you are touched and inspired by what you've seen above, please help us to perform our next bedroom makeover by making a donation of any amount today. Our work is only possible because of your generous contributions and loyal support!